Feel free to send a patch! Just make sure it is relevant. It strikes me that the message line is not really all that needed, but easy to do with a simple icon. (I'm assuming that by message you mean an IM, not a /tell) I'm not sure the *logout* time is available, nor the "where" (by which I assume you mean in Atys.) I'm really sure that putting any significant amount of text into a box like this will make it unreadable if you have 30 or 50 guild members. 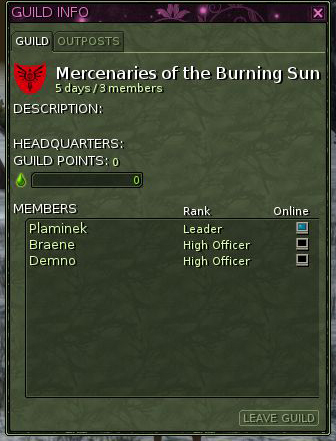 If you need that info without going to your Notebook, make your guildies put it into their Information, and read that through the Friends List. Moniq will undoubtedly tell me what information can actually be accessed. The main question I would have is: What purpose would this really serve? look at the game from the perspective of a new player. ryzom is a game of 2004 (I know that, I have an account from 2004). still the same. too many things are hidden or non user-friendly. the player comes and does not want to look for commands. ..
limit text? no - new window and text area or "alternative text"
You mean via API? Last login, last logout, played time and map coordinates of your avatar. So then the only thing needful would be a convenient translation of x,y,z to, for instance, Maiden Grove. Basically, to that you need a database with coordinates. Z axe is not too important. But we talk about client UI window which has (probably) much more options. Or did I miss something? Perhaps info would be 1. Last time online, and maybe times online during last month. 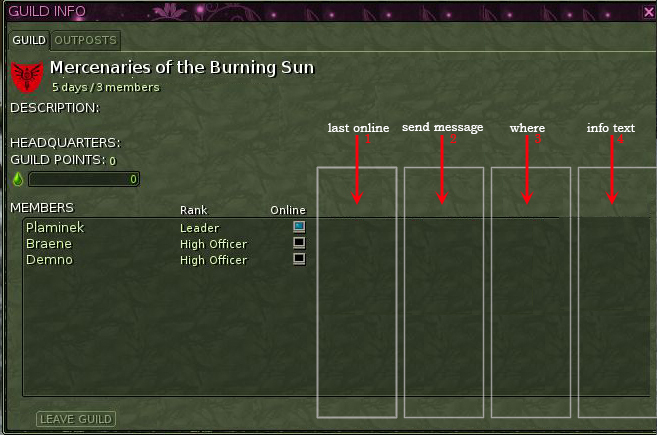 or 2. a direct link to mail that person in your guild asking how they are since you haven't seen them in a long time. Not really sure what other info to include yet, that is open for discussion.